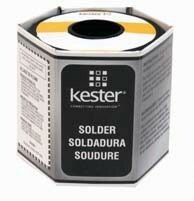 High quality rosin core solder made by Kester. This is a leaded solder and is commonly used in electronics assembly or repair. Rosin “44”® is a high activity RA core flux designed for excellent instant wetting action, even on Nickel surfaces. Although “44”® is a RA-based material, the residues are non-corrosive if not cleaned. Per J-STD-004, “44”® is classified as ROM1 flux. NOTE: Picture provided is of reasonable likeness. "44" Flux Residues: The question is frequently asked are "44" flux residues harmful to an assembly. The “44” flux residues are non-conductive and non-corrosive. Residue removal would normally be for cosmetic reasons. If the assembly is in a heated environment and sees temperatures of over 160°F the flux residues will re-melt. When liquid (at high temperatures) the residues are conductive.